The visitor went inside for the service, found an empty seat and sat down A young lady from the church approached him and stated, “That ‘ s my seat! You took my place!” The visitor was somewhat distressed by this rude welcome, but said nothing. The trouble with many of us is that we spend too much of our time worrying about “what is mine” rather than “what is the Lord`s”. We should be in the business of recognising what he has done for us and respond accordingly with gratitude. Well, almost over. Tomorrow is the last day. After all the excitement, pain and what have you of yesterday today seemed a bit of an anti-climax. It got off to a good start though with the Fresh Ways Working Group report, which is the product of JAMWPEEC (the joint Anglican/Methodist working party on emerging expressions of Church). Te report is contained in the attached photograph. 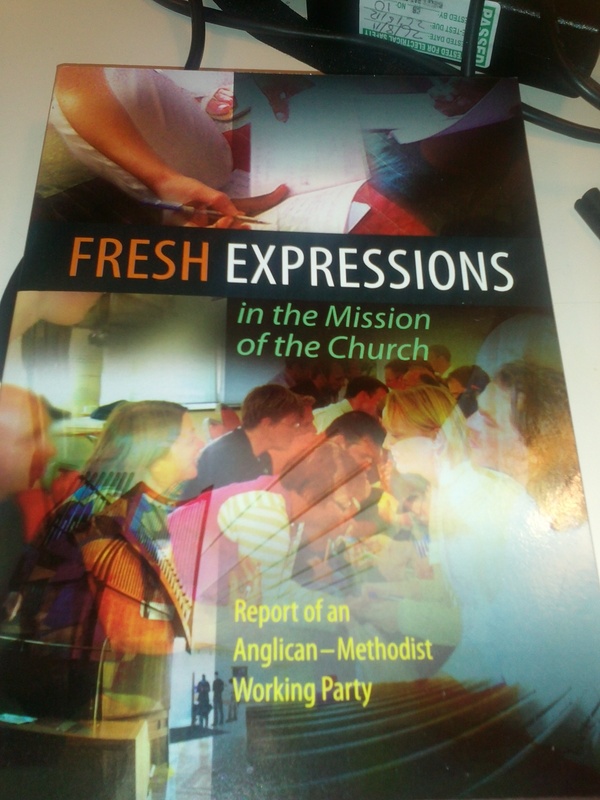 We learnt that amongst the latest statistics for the Methodist Church there were 1828 fresh expressions in Methodism last year covering 82% of Methodist Circuits.. 552 met weekly, 306 fortnightly and 720 monthly ( I know that doesn`t add up !). 34,374 people attended these expressions and 3460 were involved in leadership. These are tremendously encouraging statistics. The report continues to support the notion of the “mixed economy” i.e. 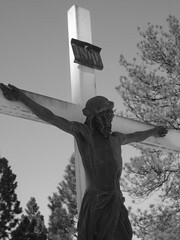 the inherited Church having as much value as fresh expressions of church. Questions are asked about training of leaders and it was pointed out that the health check list on page 192 should apply to all Churches not just fresh expressions. At some point I may come back and blog about these aspirations. This afternoon began with a Bible reflection by a Minister from Tonga on Psalm 103. The MRDF (Methodist Relief and Development Fund) followed by reporting on the work they were doing amongst African women helping them to grow peanuts and thereby becoming self-sufficient. This in turn helped families to be fed and educated. 110,000 people have been helped through this and other MRDF programmes. Wonderful quote today “No-one can make a greater mistake than he who does nothing” So true. And then the difficulties came…………………….. We moved into a review of the Senior Leadership of the Connexional Team from whom there was a proposal to take away a couple of Connexional posts as part of the cost cutting exercises Conference has asked for in recent years. Well, we got into a wonderful muddle with Notices of Motion, emergency Notices of Motion, resolutions, points of order, getting the wording right and so on. Whilst no-one fell out with anyone it was very time-consuming and laborious, and yet it had to be done because we were debating peoples jobs and lives; it had to be right. Didn`t half make me thankful that the worst I have to chair is the Circuit Meeting ! The result of the debate was that Connexional posts are to go, so prayers were held for those staff who were losing their jobs and for those whose workload would increase. A second day of pain and tears. Other items that were discussed today included a new Notice of Motion requesting that the Government do more to seek and end to Israeli attacks on Palestinian settlements, and another sought reconciliation between the Fijian Methodist Church and the government of Fiji. This shows the wide and diverse range of issues covered at Conference. We are now running badly behind time and the chances of us getting away on time tomorrow are slim. Already we have been told we`ll be working through coffee break. Should be interesting !!!!!! This was always going to be the tough day and in many ways that proved to be the case but in other ways it was good too. The report explained how 300 young people had attended the 3generate event to make their views known and it was both encouraging and challenging to hear some of their views shared with us. We really must ask ourselves the question “How many young people do we have on our church councils/circuit meeting ?” If we havent any “why not ?” “Could it be because of how young people percieve meetings ?” If so, do we need to change the meeting format ? It was emphasised over and over again that we shouldn`t be asking what can we do for them, but instead what can we do with them and what can we learn from them ? Presidency in a fine way. This was a tremendously exciting report and it is encouraging to see and hear of the fine work amongst and with young people. As with yesterday the report concluded with prayer. In the second session of this morning the difficult report that we were all dreading began, Fruitful Field. Basically this is a report outlining new proposals about how the Church would carry out its training from Presbyters and Deacons to Local Preachers to other training programmes amongst lay people. The difficult part for many was that it proposed a new system of creating two learning hubs around two of our existing colleges; the training would be disseminated from these two places into various areas around the country. The hard part was that the two hubs proposed were Cliff College, Derbyshire and the Queens Foundation, Birmingham. To adopt the proposal meant that all other training institutions would have to, in effect, close. 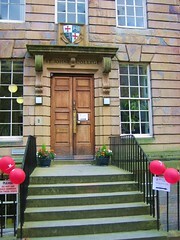 For me that would mean my own training college, The Wesley Study Centre in Durham, (photograph below) would close. The debate began with some wise words from our President Mark who asked us all to “speak with the love of God”. Mark then guided the debate with gentleness, humour and sensitivity. A Notice of Motion requesting this be referred back to Methodist Council for further work. This was resisted as it was felt it would simply delay the inevitable and cost more money in the meantime. Another Notice of Motion came through suggesting the Wesley Study Centre as a third hub, but this too was resisted. At the end of the debate which lasted till 4.30 p.m. the proposal to go ahead was carried and so The Wesley Study centre (and Wesley House, Cambridge) is no more. Yes, it will take some time to close as it currently hosts students who will have to finish their courses, but close it will. For those of us who have been there almost since its inception this is a very sad day and many of us were in tears at the end. Even now, at 11.30 p.m., I`m still feeling battered and bruised. However, there is peace also. The difficult issue was handled with a real sense of graciousness where both pain and humour, tears and laughter, agreement and disagreement could be combined. As I said yesterday, this was Methodism at its best. Has Gods will been done ? Only time will tell but it felt today like a new start, a fresh beginning for Methodist training. No doubt there will be some who will never believe that it’s the right decision, but we trust in the God who calls, resources and leads us forward when we let Him. The session concluded with the singing of “This, this is the God we adore”. As the President pointed out Methodists usually sing this with vigour and a certain amount of triumphalism, but at his request it was sung quietly today carrying with it our hope and our confidence in a good God who both understands and cares. 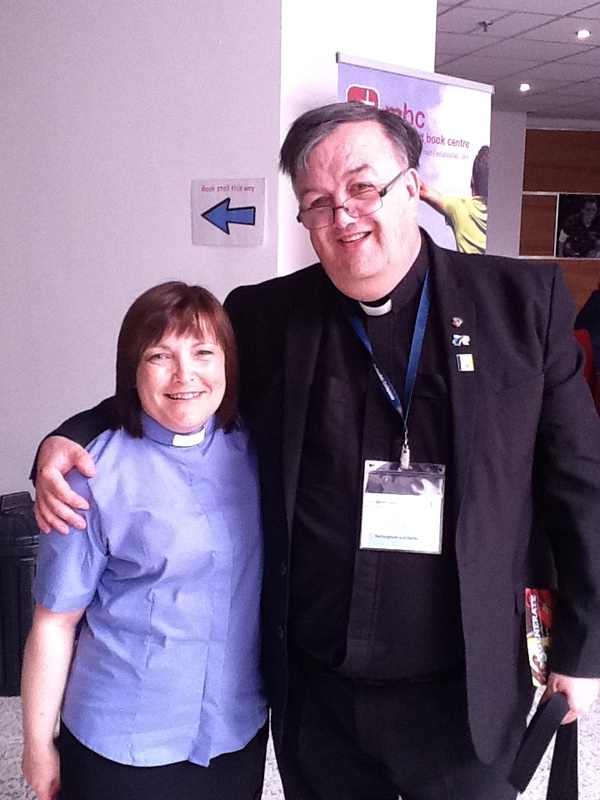 Quite a long day today and I`m feeling that good old Methodist glow (a euphemism for `knackered`). We began with the District team praying in the hotel foyer at 8.30 a.m. and then Conference opened with prayers at 9.00 a.m. Prayer has featured very highly today as both the President and the Vice-President concluded several items of business by praying for what was happening. This was in addition to the hymn singing which usually concluded business before tea break and lunch break. The first item of business was the METHODIST COUNCIL REPORT. Conference actually `meets` all year round and not just for one week in the summer; it does this by discharging responsibility to various committees and to the Council. These groups do what may best be called the day-to-day running of the Conference rather than calling 400+ delegates together every time a decision had to be made. 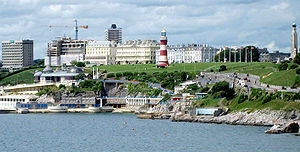 Out of this report came a very lively debate about the future venue for Conference itself. It boiled down to a decision between keeping the tradition of moving around the country, which some felt gave ownership of Conference to the Methodist people, or booking into a single venue for up to three years which would help with cost and continuity. The decision was close, 138 votes in favour of the resolution to seek the latter option to 137 votes against. As it was so close Council, who now have a mandate, said they would consider very carefully what to do. That got us off to a good start. This was followed by debates upon the Methodist Ministers Housing Society who are struggling to cope with the number of supernumeraries. In order to deal with the subsequent cost they are having to put rents up, at a time when many are struggling to make ends meet as it is. They are hoping that many retired Ministers will b e able to apply for state benefits, but as it was pointed out there is no guarantee that benefits will always be there. Apparently, we learnt, that outside of London a couple with an income of £178.80 are classed as being in pensioner poverty !! The Faith and Order group led us in a good discussion on authorisations to preside at the Lords Supper, with particular reference to Fresh Expressions of Church where the Presbyter may not be known by or sensitive to the needs of the local expression (because he/she aren’t in attendance often enough). This was passed, despite one ex-vice-President declaring it could take us down a slippery slope and we should hold our Wesleyan traditions. It was kindly pointed out to him that Methodism isnt just a Weslyan Church but a large part is of a Primitive background (i.e. from the old Primitive Methodist branch of the denomination). The same group also led us in a new liturgy that has been written for those wishing to reaffirm their Baptismal Faith using Water. Quite a step forward for Methodism. It will be interesting to see if this is as much of a landmark in changing our thinking as some think it will be. As I say Methodism at its finest; good debate, spiritual, prayerful, humorous and a real sense of fellowship even at moments of disagreement. I pray it continues. Tomorrow (Tuesday) we receive our Youth report and the Fruitful Fields report about major changes to training within Methodism which will impact our Ministerial, Local Preaching, and local Church level training. Potentially the biggest report of the week. Please pray for all who will take part in it. Conference Sunday is always a red-letter day within Methodism for it is the day that our Ordinands are received into Full Connexion and then Ordained. Reception into full connexion always takes place within the full Conference itself and for me is always inspiring. To see the Ordinands lining up to receive the Conference vote which allows them to move forward into Ordination always brings a lump to my throat; more so for this year I was supporting Rev Sue Preston, a close and dear friend. Sue hasn`t had an easy ride to get here and I`ve done all I can to support her and her family, Chloe and Natasha. So to see her standing on the stage was a real source of joy and delight. Afterwards we travelled to Cramborne, over the border in Cornwall, to see Sue Ordained as a Methodist Presbyter (usually referred to as a Minister). 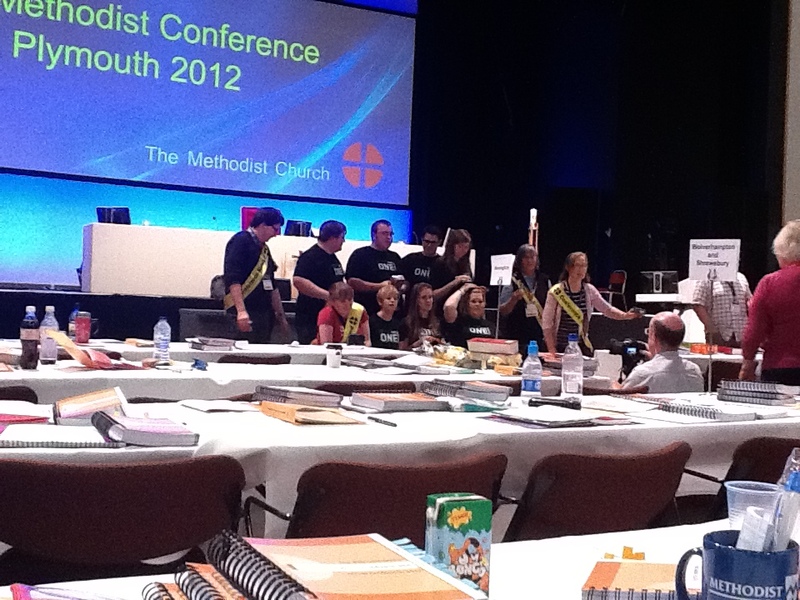 The Methodist tradition is that the congregation are asked if the candidates are fit and proper to serve as Presbyters. The congregation reply by proclaiming loudly, with exuberance, “THEY ARE WORTHY ! “ A truly spine tingling moment. It all brings back memories of my own Ordination day at Derby assembly rooms and later at Burton upon Trent. All in all its been a smashing day and one I will remember for a long time. Please remember us all tomorrow in prayer as we get down to the decision-making process. Provisionally we are discussing the Methodist Council Report, the Connexional team Report, the annual accounts, the budget, Methodist Ministers pension scheme, the housing society report, a presentation on the statistics for mission and a report from the Faith and Order committee. The major report is the result of the Presidents inquiry on Safeguarding. This will be a very sensitive report and I pray it is well presented. So as you can see it is a busy day tomorrow, starting with prayers in the hotel lobby at 8.30 a.m. opening of Conference at 9.00 a.m. and then closing at 7.00 p.m. Depending on how I feel I might then go onto the MET meeting (Methodist Evangelicals) at 7.30 p.m.